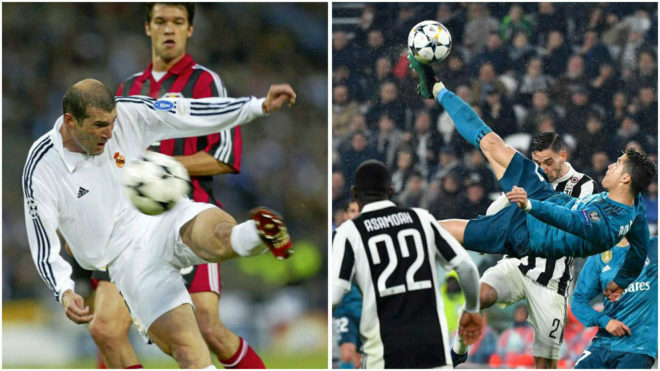 Cristiano Ronaldo hit a strunning overhead kick in the Champions League quarter final victory away to Juventus, and Zinedine Zidane joked that while one of the best goals ever, it wasn’t as good as his against Bayer Leverkusen. Zidane’s strike came in the 2002 final at Hampden Park and has widely been considered as one of the finest in Champions League history. “Cristiano’s is one of the best goals in history, but mine in Glasgow was prettier,” he said in jest during his post-match press conference. “You have to tip your hat to a goal of this quality. Isco returned to the starting line-up after a significant spell away from it, and the French coach praised the performance put in by the Spanish midfielder. “He put in a very good performance, he played between the lines well, covering Bentancur,” he intimated. “He opened up the pitch and gave the pass for the first goal. When pushed on his reaction to Ronaldo’s second goal, the former Juventus midfielder made clear it was a moment of pure emotion. “I think I felt the same as what everyone else did,” he explained.